This is trinitite, a mineral from the area of the first atomic bomb test in New Mexico. The sand was melted by the heat and encloses traces of Plutonium. 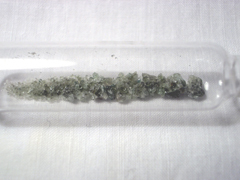 Amount: trinitite 0.2 g, Plutonium fraction unknown.